Welcome to the North Texas School of World Dance! See the complete class schedule below. Also check out the Bellydance Workshops that are offered on the weekends that cater to all different levels of Bellydance students. Private and semi-private lessons are also available. New Bellydance Classes Start March 19 & 21, 2019! Benefits of Learning Bellydance, AND Benefits of Studying with Sa'diyya! Bellydance is a beautiful dance form that everybody can benefit from learning. People of all ages, sizes, genders, ethnicities, races and religions with different goals and interest levels will find it to be great low-impact exercise, a creative outlet, a good way to meet new friends and a peek into other fascinating cultures different from their own. Students join Bellydance classes for many different reasons and each of these reasons can be accommodated by studying with the Multiple Award-Winning and Internationally Recognized Bellydancer, Sa'diyya. Whether it's for fitness, camaraderie, or to become an accomplished performer of Bellydance, studying with Sa'diyya offers a supportive and friendly environment, thorough and detailed instruction, high energy and fun classes and even performance opportunities for those interested. Small, intimate classes and more undivided attention add up to more successful dance students. Attendees will benefit more from Sa'diyya's classes because everyone will receive individual, specific attention directly from Sa'diyya throughout each class. And, Sa'diyya creates custom Facebook groups for each class so students can have direct access to Sa'diyya and get additional information pertaining to the classes! Don't wait any longer to start your journey into the unique and exciting world of Bellydance - Sign up to dance with Sa'diyya today! Come learn a fun and spirited Beginner level Bellydance to lively music! We will also incorporate a tambourine into the dance, so please bring one. In this 6-week session you will an exciting 3 1/2 minute choreography complete with shimmies, hip work, turns, & undulations! This 6-week session lasts from March 19 - April 23, 2019! The choreography is set to the song, "Way to Eden" by Emad Sayyah from the album, "The Magic of Modern Bellydance." ​Buy it on iTunes HERE and on Amazon HERE. ﻿STARTS MARCH 19TH! Register HERE. Pre-Pay HERE. ​GET A DISCOUNT FOR MULTIPLE CLASSES! 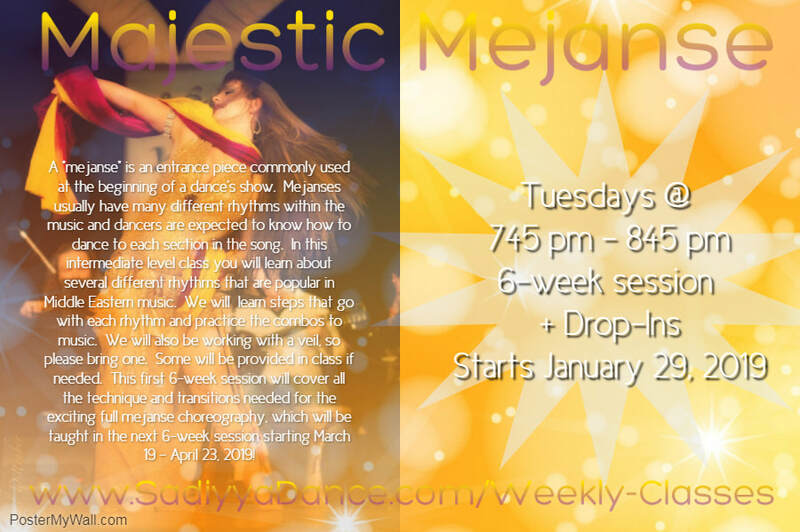 Tuesdays 7:45 pm - 8:45 pm - "Intermediate Majestic Mejanse: Choreography Session"
A "mejanse" is an entrance piece commonly used at the beginning of a dancer's show. Mejanses usually have many different rhythms within the music and dancers are expected to know how to dance to each section in the song. In this intermediate level class you will learn about several different rhythms that are popular in Middle Eastern music. By the end of this 6-week session you will have learned an exciting, full 6 minute entrance choreography! Please bring a veil. The choreography is set to the song, "Cinderella" by Khader Ahmad from the album, "Dum Tak Revolution, Vol. 2." Buy it on iTunes HERE and on Amazon HERE. ﻿STARTS MARCH 19TH! Register HERE. Pre-Pay HERE. ​GET A DISCOUNT FOR MULTIPLE CLASSES! Thursdays 6:30 pm - 7:30 pm - "Intermediate Dreamy Drum Solo: Choreography Session"
Drum solos are usually the grand finale of a dancer's performance! These dances showcase a dancer's advanced technique, isolation skills and amazing feats of abdominal control! In this class you will learn a cute and challenging drum solo choreography that will test your technique and sass. Get ready to learn AND master a DREAMY full drum solo choreography! SEE A VIDEO OF THE CHOREOGRAPHY YOU'LL LEARN IN THE VIDEO BELOW! The choreography is set to the song, "Cleopatra's Frenzy" by Susu Pampanin from either of the albums, "The Masters of Bellydance Music, Vol. 3" or "Dancing Drums." Sa'diyya provides an edited version of the song to students but encourages students to purchase the original version, too. Buy it on iTunes HERE and on Amazon HERE. ﻿STARTS MARCH 21ST! Register HERE. Pre-Pay HERE.​ ​GET A DISCOUNT FOR MULTIPLE CLASSES! SEE A VIDEO OF THE "DREAMY DRUM SOLO" CHOREOGRAPHY YOU'LL LEARN IN THE VIDEO BELOW! Thursdays 7:45 pm - 8:45 pm - "Advanced Saucy Saidi: Choreography Session"
2 DANCES! Traditional Saidi & Double Stick Saidi Drum Solo! Many of the steps used in Bellydance come from the many folkloric dances around the Middle East. One of the favorite folkloric styles of many dancers is Egyptian SAIDI! Come learn about this cheeky style of dance including the rhythm, steps & stick technique. You will learn 2 Saidi dances that will delight and excite! It is recommended that you already have prior dance experience with sticks or "asaya." ﻿STARTS MARCH 21ST! Register HERE. Pre-Pay HERE. ​GET A DISCOUNT FOR MULTIPLE CLASSES! Beginner "Queen of the Tambourine"
​Fill out the student registration form HERE. Pay for your class HERE. Got questions? Contact Sa'diyya HERE.